You are at:Home»Things to Do»Play»Playing Inside»Play京: Where and When to Get Your Baby Play Date On! Whether it’s your first baby or you’re a seasoned parent, the monotony of the early months can take its toll. You and baby may have spent a multitude of days getting to know one another, asking Alexa to play the best of nursery rhymes, and getting in a sneaky episode or two of your favorite box set when you finally get your little one down for a nap. Although hibernation with baby can give you the respite you need, one day can seemingly blend into another before you realize you’ve had no contact for ages with the outside world, other human beings, and the fresh (and sometimes not-so-fresh) air. If your week is in need of a refresher for baby and you, there are plenty of opportunities in Beijing to bring some color and life into your schedule. Take advantage of the many playgroups around the city which give moms (and dads) the chance to break the solitude that sometimes comes with caring for a newborn or toddler, and the opportunity to meet and befriend other parents. These groups also offer a safe and stimulating environment to promote the cognitive and physical development of your little one. Get out the baby-bag, pack up the formula, dust off the stroller and call a Didi – it’s time to play! 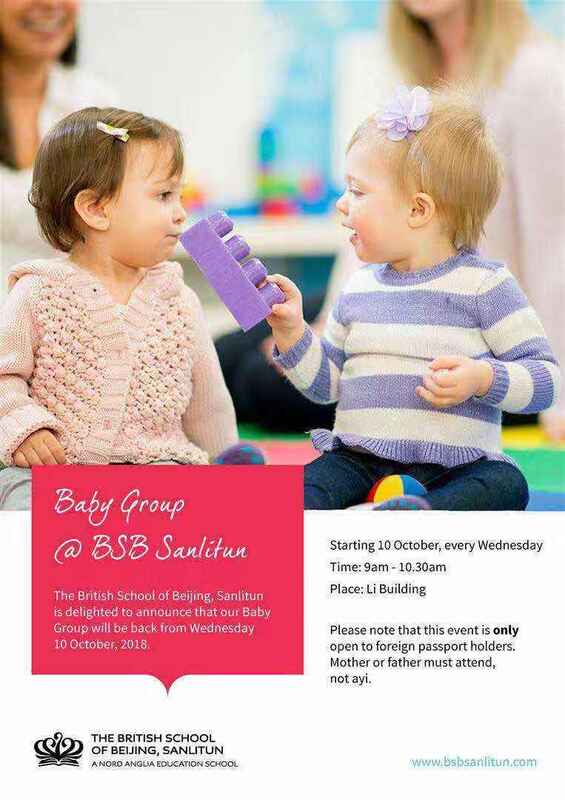 The Bumps to Babes (B2B) volunteer groups in Beijing offer a varied range of free playgroups at the Canadian International School of Beijing (CIS) campus and CIS Kindergarten. Catering for different age groups (named using the animal that represents the year your baby was born according to the Chinese calendar) and locations for both expecting mothers and families, there’s truly something on offer for everyone. On Tuesdays, the Little Roosters group offers playmate time for babies born between February 2017 and January 2018. The Little Puppies group takes place every Wednesday and caters for babies born between February 2018 and January 2019. The Little Monkeys group is held every Thursday and serves parents who have babies that were born between February 2016 and January 2017. And every Friday, the B2B CIS group offers a mixed age playgroup. To find out more information and be signed up to these and other groups on offer, please email beijingbumps2babes@gmail.com. Be sure to ask to be added to the B2B Beijing WeChat group, which provides a chance for moms and dad to get their hands on family-friendly deals around Beijing. Join in the sing-along every Monday and Thursday. 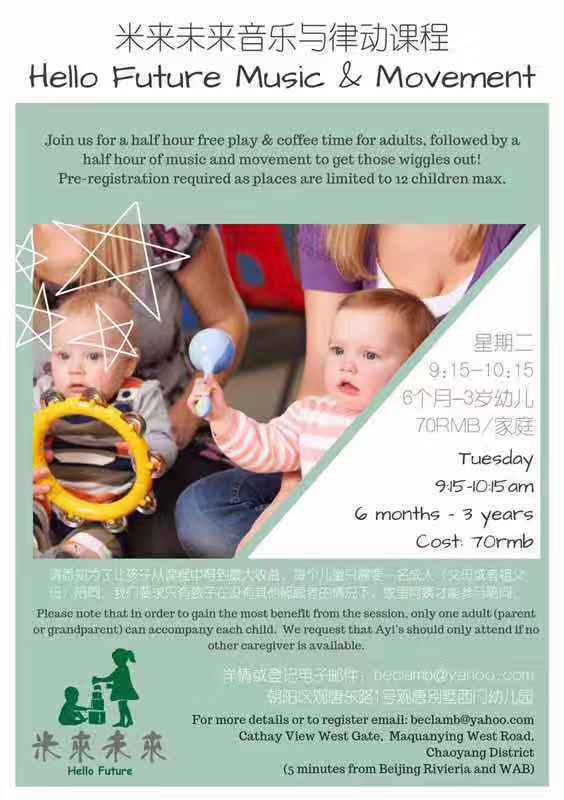 Expect structured activities centered around Chinese music and play. This vibrant group caters for babies from 0-6 months, and ayis are welcome. Warm up the vocal cords, shake a tambourine and get ready for good vibes, baby laughter and a good natter with fellow moms and dads. RMB 80 per class. Every Monday and Thursday 10-11.30am. Apartment 401, Unit 1, Building 32, Xingfuercun, Chaoyang district.